FVP-5000T is Humax’s most versatile Freeview Play recorder yet | What Hi-Fi? 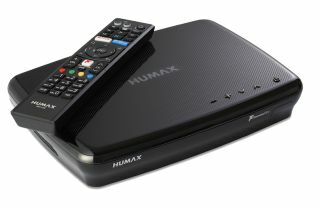 The latest Humax box offers 500GB, 1TB and 2TB hard-drive options, improved usability and three digital tuners. Humax claims the FVP-5000T – a direct replacement for the FVP-4000T – is the only Freeview Play Recorder with three digital tuners, allowing users to record up to four programmes at once while watching another live channel. There’s plenty of built-in storage to make use of that functionality too, with 500GB, 1TB and 2TB storage options accommodating up to 250, 500 or 1,000 hours of recording respectively. With the subscription-free Freeview Play service built-in, the FVP-5000T offers 85 TV channels (15 of which are in HD) and over 25 digital radio stations – all accessible via an eight-day electronic programme guide (EPG) where users can record programmes and access those that have aired in the past seven days. There's also the service's full suite of dedicated TV catch-up service apps, including BBC iPlayer, ITV Player, All 4, Demand 5 and UKTV Play. To access them, users can connect the box to the internet via its built-in wi-fi or ethernet socket. It also has two USB inputs. Humax has improved usability, claiming that the FVP-5000T is the brand’s “easiest to use Freeview Play Recorder yet”. It has a faster, slicker interface than its predecessor, as well as two new Humax-designed features: ‘Smart Search’ (for searching for programmes across the Freeview Play ecosystem) and ‘Top Picks’ (a recommendation and discovery service of popular content). An all-new Humax Live TV App provides an alternative to the remote control, and allows live TV be streamed to a connected smartphone or tablet. The FVP-5000T can also be paired with the Humax H3 Smart Media Player for multi-room TV. The Humax FVP-5000T will be available from 1st October, priced £230 (500GB), £260 (1TB), or £300 (2TB).